In a speech on February 7 highlighting steadily escalating Anglo-Argentine tensions, the explosive issue of the Falkland Islands was the focus. Argentine President Cristina Fernández de Kirchner announced that her government was prepared to denounce London’s “latest re-militarization of the South Atlantic” before the UN’s General Assembly, the Security Council, and the Committee on Decolonization. 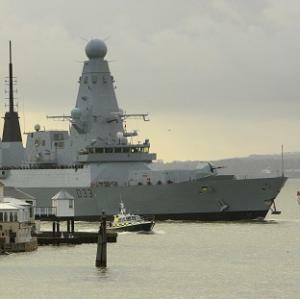 The increased “militarization” that President Kirchner was condemning refers to Britain’s recent deployment of its most modern and formidable destroyer, the $ 1.5 billion HMS Dauntless, as well as to the rumored deployment of a nuclear submarine, which has neither been confirmed nor denied by British authorities. The Argentine government saw an act of aggression when the Duke of Cambridge, Prince William, was dispatched on a six-week training tour as search and rescue helicopter pilot in the archipelago..
Not surprisingly, in her speech, President Cristina Kirchner failed to mention the increasingly aggressive tactics that her own government (and that of her husband before her) has pursued against Britain’s claim to the Falklands in these last two administrations. 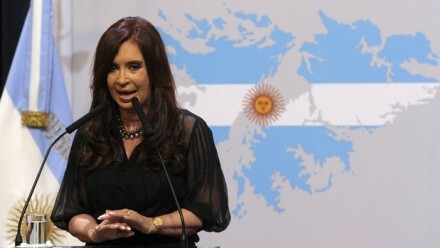 Last September, President Kirchner formally raised the Falklands issue before the UN General Assembly. At the time she threatened to suspend certain bilateral agreements affecting Britain, such as biweekly air travel to the archipelago from Chile, if Britain refused to enter into talks about the Falkland Islands’ future. Additionally, on December 5, Argentina launched a series of maritime exercises to isolate the Falklands, detaining various forms of fishing craft that it interpreted as capable of “breaking the blockade” around the islands. On January 11, Argentina started a “squid war” against the archipelago, urging Argentine fishermen to catch the squid before it reached the British beaches. Since late January, Argentina has been able to routinely secure a vote of confidence from fellow members of ALBA and MERCOSUR, with these Latin American states supporting its bid to claim sovereignty over the islands. Venezuelan President Hugo Chávez even went as far as to give support for Argentina in the unlikely event of a military standoff. Though this was largely a symbolic gesture, (ships flying the British flag would still be allowed to enter these ports) it struck a considerable symbolic blow to Anglo-Argentine relations. All of this culminated in last week’s speech, when President Kirchner pledged to a room full of politicians and Falklands War veterans that she would take her case against Britain to the United Nations. Throughout all of this, the crux of London’s stance—that the Islanders’ desires should be protected above all else—has remained unaltered. The tense foreign policy stances of these two nations reflect escalating domestic troubles in both countries. Ironically, the bellicose attitude of both protagonists comes at a time when their military preparedness is greatly diminished in real terms. The British Defense Ministry is scheduled to be particularly hard hit this year by further budget cuts (two percent cuts were announced in 2011). 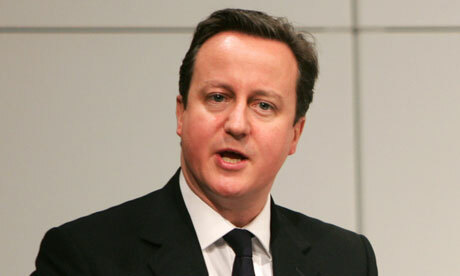 When Prime Minister David Cameron organized a National Security Committee in January in order to review the diplomatic strategy affecting the Falklands region, the issue of securing the archipelago amidst cuts in military appropriations, particularly regarding the Royal Navy, was of prime concern. Many critics of Cristina’s unalterable stance on the Falklands argue that her position is really just a way to deflect attention from the country’s growing domestic woes. Speculation surrounding the nature of the Falklands/ Malvinas conflict has intensified in the intervening years and has been full of subtle revelations suggesting that the conflict has become a massive distraction meant to becloud the Argentine public. It can be seen as an effort to keep foreign observers from peering too closely into allegations of corruption, executive ineffectiveness, and out-of-control inflation. While Argentina recently showed one of the highest GDP growth rates in the entire region, it has also faced criticism by the IMF for the quality of its INDEC inflation figures (which are uncomfortably high). The fact that the country’s financial papers remain locked into a low investment grade status is further cause for concern, according to critics. Due to gross public spending, austerity measures are gradually being enforced on a provincial level, making the prospect of rising social tensions palpable. Although she was widely popular after initiating her presidency in slow gear, and flanked at first by considerable carping, President Kirchner’s warm public reception is beginning to cool. Unemployment is rapidly climbing; inflation could be as high as 25%, and the accuracy of official statistics are being chronically challenged. The government could be in for a long siege where a distraction like that of the Falklands could prove increasingly welcomed. According to a poll by Ibarometro, seventy percent of Argentines that were surveyed consider the bid to reclaim the Falklands important, though only thirty percent would want the country to go to war. Britain would also be hard-pressed in winning over support for a war against Argentina, especially after the country’s protracted and costly experience in Iraq. Of course, neither Argentina nor Britain might not be so concerned about control of the Falklands if there were not so many natural resources to be extracted in the region, particularly that of oil. Though in the early nineties there was talk of a bilateral oil mining co-dominion between Britain and Argentina, with the ascension of the Kirchners to power, any collaborative talk was muted. The British Geological Survey reported that there are substantial off shore oil reserves that could procure 500,000 barrels per day. Three prominent oil-exploring firms have been prospecting on the ocean floor surrounding the islands: Borders and Southern Petroleum Plc, Rockhopper & Desire Petroleum. The potential rewards for investment in offshore drilling have been compared to the 2007 offshore Jubilee field discovery in Ghana, which turned that country into one of the top fifty oil states in the world. Morgan Stanley has ranked the Falklands region, which could potentially contain 8.3 billion barrels of oil, as one of the top fifteen offshore prospects of 2012, though later estimates have tempered these high expectations. Despite some continued claims of lucrative possibilities, larger oil companies so far tread a fine line, making certain that they do not get involved in the political dispute at hand, thus stalling any momentum forward as talks are carried on behind the scenes. A tantalizing side bar to the 1982 legacy of the Argentine-UK altercation will be furnished when the still confidential Rattenbach report is entirely declassified. After its defeat in the Falklands war and before turning over the authority to civilian rule, Argentina’s military government assigned Colonel Benjamin Rattenbach with the task of preparing the aforementioned report, leading an internal investigation team to examine the main mistakes and setbacks that lead to Argentina’s ultimate defeat. According to an informal version of the report published by the Argentine magazine “Siete Días,” its findings mention that “there was a lack of application of the joint training doctrine.” Instead of having an interest in a unified Air Force, Argentina’s Navy also retained control of a semi-private Air Force Battalion which, as a result, impaired the effectiveness of their attacks on the British Navy’s unit. The report claimed, among other things, that pilots had not been trained to fire against moving targets in the ocean. In other words, the Argentine offensive approach against the British was improvised. Although others praised Argentina’s military strikes, the report indicated that sixty percent of the bombs dropped on the British ships failed to explode. Besides pointing a searchlight at all corners of some of the more controversial aspects of the decisions being made by the Argentine military Junta, the report also contains key information on the conflict regarding the germane international framework at the time. Now with the declassification of the report, Cristina Kirchner is likely to seek evidence that will strengthen her arguments regarding the formal claims filed before the U.N. against Britain. Unfortunately, the ground rules dictate that the full report will not be disclosed. A commission was assigned to analyze the document in thirty days (starting from February 7, 2012) and only parts that are of interest to Argentina’s security requirements will be formally published. This is because the reports—if useful—could tabulate a skein of acts of skullduggery on the part of the Argentine military junta of the late 1970s. There are still a number of issues regarding Washington’s attitude towards the Argentine attack against the Falklands in 1982 that need amplification and clarification. The Reagan Administration may have played a considerably larger and more sinister role in the detonation of the Falklands war than previously acknowledged, and it may have provided considerable comfort to the Argentine side. While there is no question that President Reagan nursed a distinct pro-British bias, the same was not necessarily true of some of his servitors. The question is how much the ambassador to the United Nations at the time, Jeanne Kirkpatrick, knew about the impending military action. The same can be asked of General Vernon Walters who was in Argentina as part of a tour of Latin America to rebuild links with right-wing military regimes in the region, to which Washington was distinctly partial. Walter was visiting senior Argentine military officials in Buenos Aires at the time that Argentine attack against the Falklands was being launched. The then commander of the Argentine Navy, Emilio Massera later told COHA director Larry Birns that Walters was informed about the Argentine military’s impending attack in a gathering at a military club and merely shrugged his shoulders. The assembled senior military officers meeting in Buenos Aires interpreted the gesture by Argentine officials in the room as one of consent by the U.S., for the attack and a similar conclusion was drawn by Ambassador Kirkpatrick, who was at the Argentine embassy in Washington for a dinner that very same evening. Circumstantial evidence indirectly shows that the Argentines present that evening could reasonably have concluded that their country’s action against the British came as no great surprise to the Pentagon. The presence of General Walters at the dinner renders this information nearly undeniable. This was particularly the case since General Walters and Ambassador Kirkpatrick were among the most influential and ranking figures in the administration as well as among the most conservative and those most sympathetic to the military Junta. Despite these highly publicized developments, one reality remains clear: Britain and Argentina are not going back to war and they both know it. Both Britain’s and Argentina’s military have been substantially downsized over the last few decades. What we may be seeing here are tactical shifts reflecting the profound changes in Argentine foreign and economic policy since the 1990s. These tactics are designed to isolate Britain in regional circles as well as in public and international opinion, in an attempt weaken its resolve regarding an emotional issue like the Falklands. Debates within Britain have revealed some small cracks in the nation’s resolve, but they are unlikely to sway Prime Minister Cameron and his Tory party to adopt a more conciliatory policy toward Buenos Aires. British political circles are convinced that there are diplomatic victories to be best harvested through skillful workings of the issue, and little to lose. This analysis was prepared by the following members of the Council on Hemispheric Affairs staff: Director Larry Birns and Research Associates Alex Gibson, Gustavo de Lima Palhares, and Faizaan Sami.